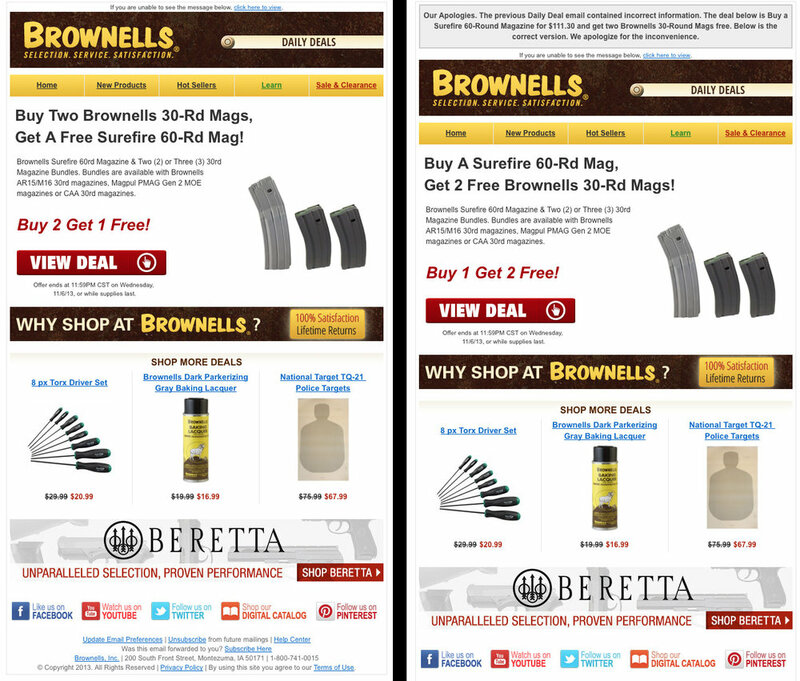 Brownells makes a major mistake in one of its e-mail ad campaigns today. Brownells has an e-mailing list you can get on called daily deals. If your not on that mailing list it is worth it since you get some great deals. Well Imagine my delight today when I checked my email and I see this Brownells daily deal. If you buy two of the Brownells brand AR-15 30 round magazines 9.99 each you get a FREE!!!!!! Surefire 60 round AR-15 magazine. Now the Surefire magazines are 111.30 each so WOW. Now instantly I knew this had to be an error, but for a split second I wanted to log in to the bank account and see how many free Surefire mags I could get. Sure enough about an hour latter I got the updated email. Here is the link for the real deal, if you buy 1 Surefire magazine the will throw in two of their house brand magazines a 20.00 value. Whoops some one got their magazines mixed up. "Get a free Surefire 60-rnd Mag!" A free mag indeed!